Here, he was writing about what he saw in his contemporary world, and about its spiritual state. He wrote this before the fall of the Soviet Union, yet his words still ring true...Frighteningly so. Anyone who looks at our contemporary life from the perspective of the normal life lived by people in earlier times — say, Russia, or America, or any country of Western Europe in the 19th century—cannot help but be struck by the fact of how abnormal life has become today. The whole concept of authority and obedience, of decency and politeness, of public and private behavior — all have changed drastically, have been turned upside down except in a few isolated pockets of people — usually Christians of some kind — who try to preserve the so-called "old-fashioned" way of life. Our abnormal life today can be characterized as spoiled, pampered. From infancy today’s child is treated, as a general rule, like a little god or goddess in the family: his whims are catered to, his desires fulfilled; he is surrounded by toys, amusements, comforts; he is not trained and brought up according to strict principles of Christian behavior, but left to develop whichever way his desires incline. It is usually enough for him to say, "I want it!" or "I won’t do it!" for his obliging parents to bow down before him and let him have his way. Perhaps this does not happen all the time in every family, but it happens often enough to be the rule of contemporary child-rearing, and even the best-intentioned parents do not entirely escape its influence. Even if the parents try to raise the child strictly, the neighbors are trying to do something else. They have to take that into consideration when disciplining the child. When such a child becomes an adult, he naturally surrounds himself with the same things he was used to in his childhood: comforts, amusements, and grown-up toys. Life becomes a constant search for "fun" which, by the way, is a word totally unheard of in any other vocabulary; in 19th century Russia they wouldn’t have understood what this word meant, or any serious civilization. Life is a constant search for "fun" which is so empty of any serious meaning that a visitor from any 19th-century country, looking at our popular television programs, amusement parks, advertisements, movies, music — at almost any aspect of our popular culture — would think he had stumbled across a land of imbeciles who have lost all contact with normal reality. We don’t often take that into consideration, because we are living in this society and we take it for granted. 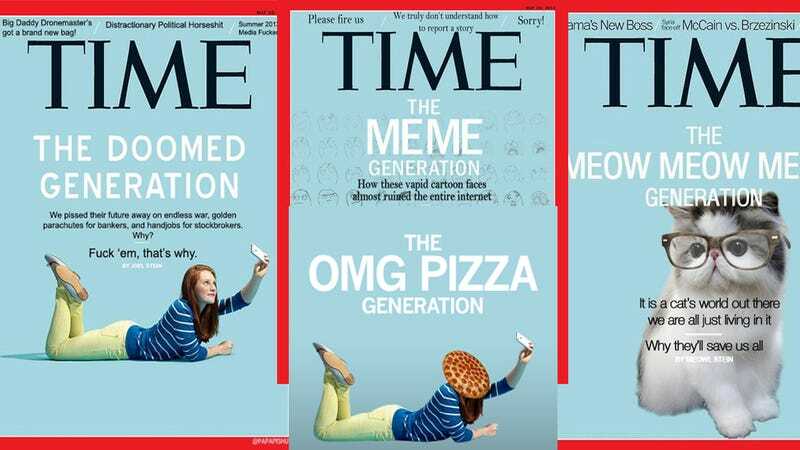 Some recent observers of our contemporary life have called the young people of today the "me generation" and our times the "age of narcissism," characterized by a worship of and fascination with oneself that prevents a normal human life from developing. Others have spoken of the "plastic" universe or fantasy world in which so many people live today, unable to face or come to terms with the reality of the world around them or the problems within themselves. When the "me generation" turns to religion — which has been happening very frequently in the past several decades — it is usually to a "plastic" or fantasy form of religion: a religion of "self-development" (where the self remains the object of worship), of brainwashing and mind-control, of deified gurus and swamis, of a pursuit of UFOs and "extra-terrestrial" beings, of abnormal spiritual states and feelings. We will not go into all these manifestations there, which are probably familiar enough to most of you, except to discuss a little later how these touch on the Orthodox Christian spiritual life of our days. It is important for us to realize, as we try ourselves to lead a Christian life today, that the world which has been formed by our pampered times, makes demands on the soul, whether in religion or in secular life, which are what one has to call totalitarian. This is easy enough to see in the mind-bending cults that have received so much publicity in recent years, and which demand total allegiance to a self-made "holy man"; but it is just as evident in secular life, where one is confronted not just by an individual temptation here or there, but by a constant state of temptation that attacks one, whether in the background music heard everywhere in markets and businesses, in the public signs and billboards of city streets, in the rock music which is brought even to forest campgrounds and trails, and in the home itself, where television often becomes the secret ruler of the household, dictating modern values, opinions, and tastes. If you have young children, you know how true this is; when they have seen something on television how difficult it is to fight against this new opinion which has been given as an authority by the television. The message of this universal temptation that attacks men today — quite openly in its secular forms, but usually more hidden in its religious forms — is: Live for the present, enjoy yourself, relax, be comfortable. Behind this message is another, more sinister undertone which is openly expressed only in the officially atheist countries which are one step ahead of the free world in this respect. In fact, we should realize that what is happening in the world today is very similar whether it occurs behind the Iron Curtain or in the free world. There are different varieties of it, but there is a very similar attack to get our soul. In the communist countries which have an official doctrine of atheism, they tell quite openly that you are to: Forget about God and any other life but the present; remove from your life the fear of God and reverence for holy things; regard those who still believe in God in the "old-fashioned" way as enemies who must be exterminated. One might take, as a symbol of our carefree, fun-loving, self-worshipping times, our American "Disneyland"; if so, we should not neglect to see behind it the more sinister symbol that shows where the "me generation" is really heading: the Soviet Gulag, the chain of concentration camps that already governs the life of nearly half the world’s population.